Amongst many Ga families in Accra, there are some notable families noted for being pioneers in the food industry in Ghana. Some are noted for producing the best Ga kenkey in over 2 decades whilst others for the tastiest beans. These families have on a small scale generated revenue with which they have taken care of their children’s educational needs all the way to University level. One such family is the Mensah family living in Adabraka one of the oldest suburbs in Accra. The Mensah family has run a small-scale Domedo business for almost 100 years and I recently paid them a visit after being introduced to them by my friend Naa Akuyea. I was curious to know what their story was , more so especially after learning that they used a centuries-old traditional cooking technique to bake pork; a clay oven which we call Flornorr in Ga. I found the house easily with the partial use of Google maps to find the Adabraka market and the usual Ghanaian method of asking strangers who will resort to using several hand gestures to point you in the right direction. Auntie Sophie seemed to be popular in the locality which was a plus for directions. The house was three houses down from a landmark building called Warehouse. I walked in to find Auntie Sophie already at work chopping up huge chunks of fresh pork. Her strong arms held a huge machete which sliced through white fat and pink sinewy muscle before hammering through thick grungy bone. A single clay oven sat squat offside in the compound house which served both as a workspace and a car parking area. A wooden shed shaded the clay oven from the elements whilst the meat cutting area was also beneath a roughly hewn wood shed. A merry blaze was already dancing around in the huddled space. My Twitter friend Kwasi Amankwah aka Stoichkov joined me on my search to learn more about these families. He literally responded to my tweet which I shared before starting out. Like joke like joke, he came there! I thought he was joking. That was too cool! He's a food chaser like me, he said 😂. I had a chat with Aunt Sophie’s mother who currently owns the business but will soon be handing over the reins to her daughter. She was a bit shy so I respected her privacy by taking only photos of her hands. We chatted mostly in Ga which has been translated here. How old is this business and how did it start? Incredible! That is almost a 100 years! “Yes. You can say that,” she responds with a smile. Where do you usually source your pigs from? Back in the day we had an abattoir in JamesTown, which we called slaughterhouse. That’s where we mostly had the pigs slaughtered. But it’s defunct now. The politicians promised to renovate the place for we the women in the pork business but nothing happened. Currently, we have a license to use a place at Pig Farm which is a popular pig slaughterhouse. 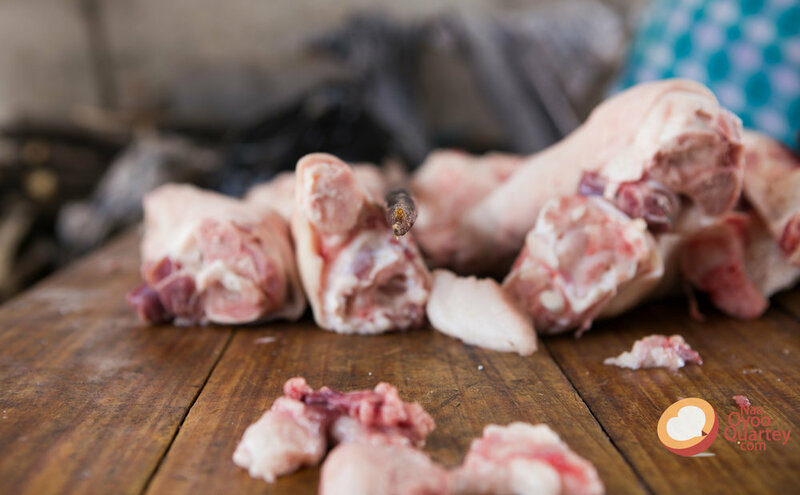 It’s often monitored by the authorities to ensure good hygiene and slaughter practices. For our Domedo, we use only fresh pork for making Domedo. Frozen pork doesn’t taste as good as fresh pork so we refrain from using that type. Today's pork cost us GHC1,400 and usually we sell all within two days. How Has The Domedo Business Added Value To Your Life? I have been able to take my children to school and my first born happens to be at Standard Chartered Bank. My other children support me in this business and by April I will be handing over to Sophie. It’s been a long journey and it’s time I hand over things to her. It has been a great experience. Where does the name Domedo come from? After baking, the skin surface becomes very hard and crunchy. The old ladies will say ‘E Do!’ to mean it’s crackling. Over time it became DomeDo. What are the intestines of the pig used for? We usually stuff the large intestines with chopped up pieces of the small intestines, we then add kpakposhito, onions and curry to spice it up. We call this Bo Loo. A little piece of it is about GHC5. How long does it take to bake a whole pig in the oven? Only about 30mins. More than that the meat will be too soft. When it’s too soft, it doesn't keep for long. So 30mins should be the maximum time. What Spices do you use for the meat? Aside salt and paprika we don’t use any other spice for the meat. The natural flavour has to be maintained and using too much spices will not only lose the meat flavour but will also not be a memorable experience of tasting pork made in a clay oven. The taste completely changes. You need to taste how pork has been made since "blemaa k3j3 niikolai man mli” (since time memorial). 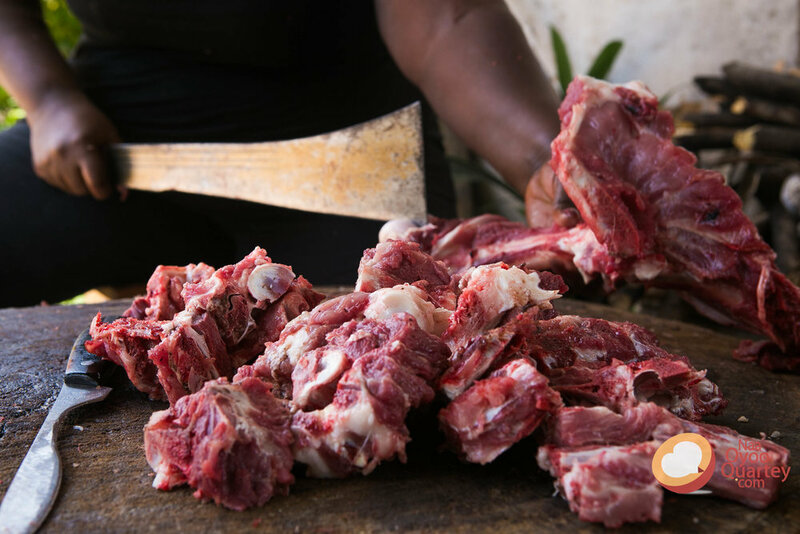 Some pork sellers add food colouring and too much spices on their meat which affects the taste of the Domedo. How did you come about the clay oven? We built it ourselves using clay bricks and ‘su’ not clay. Su is a type of red sand which is used to cover the bricks to prevent smoke from escaping from within. When the pork is placed in, we use a wooden door to block the entrance and add mud to the edges to block any openings. The smoke has to stay in as much as possible. I have taught my children how to build it although getting the materials isn't as easy as it used to be. Why do you use the Clay Furnace Oven to bake pork & not a Gas Oven? Because the flavour from use this oven is absolutely divine! It’s earthy, more succulent and lightly smoky which cannot be replicated using a gas oven. Some Domedo sellers of late, do not want to be bothered with the clay oven because of the heat and smoke so they usually boil the meat and bake it in a gas oven. Some also deep fry it but none of those cooking techniques gives you the original flornorr flavour. At what times do you sell the Domedo? Mostly in the evenings from 5pm. We have a lot of office workers who also come by after 12pm to buy a handful for lunch. Domedo can be eaten with Banku, Yam chips or Ga Kenkey. Some of our customers also order the meat for their private events. I have big plans to first of all, give the business a name and bring exciting new items to accompany the pork. I also plan to expand the business to other areas in Accra- Auntie Sophie. It was such an engaging conversation with Auntie Sophie's mom and I continued with Auntie Sophie herself as she worked on the pork. The Domedo making process requires a lot of physical energy and I could see why other pork sellers avoid the use of the clay oven. But why miss out on preparing food which is way tastier than the competition? I took part in the Domedo making process because why not? There was no chance of me missing out on such an opportunity! That oven tho'😅 was hot AF! Auntie Sophie asked me to place the empty metal bowls in the furnace which catches the pork juices and I tried and almost run away😂. I could feel the heat changing my DNA 😂, my skin grew taut and I simply shook my head. No siree! But I managed to lift the pork unto the wooden paddle which I then moved into the oven. That wasn't too bad😬😁. They had quite a laugh at me but congratulated me as well. Victory is sweet! I was pretty stunned to discover how our domed shaped clay oven resembles that of the beehive oven which has been used in Europe during the Middle Ages to bake bread, cakes and meat. The pork really and indeed was done in 30minutes, I marked time. What a gorgeous fragrance of baked pork! As I grew closer to the entrance, I could feel the very warm heat plus moisture in the oven emitting out. I have never experienced anything like this before! It was humbling to say the least. It was as though I had travelled back into a time of watching my ancestors preparing their evening meal using the flornorr. The dying embers of the fire were coated with some escaping juices which added to the undeniable fragrance of fresh pork. Kwerr!! I could almost taste the golden brown colour of the meat. Taste color! Imagine oh! The pork was then lifted out using a sharp rod. This was a whole pig 🐷 roasted in one day in the clay oven which will then be prepared for sale in the evening. The pig's teeth were removed after as it was much easier to pull the cooked meat from the bone without damaging the skin. The pork juice which is caught in the metallic bowls is served with the domedo when one requests for some. According to Auntie Sophie, this juice is called 'Sars', a lost & mispronounced version of the original word Sauce. Thats how we do 😉. This Sars juice goes great with Gari and ground red pepper, she said. Really? Now that's something I have to try. The oil which rises above the juice is also preserved for other uses like making okro stew. That also is something I have to discover for myself 😜. Kwasi and i bought some pork to take home with us and my husband for one couldn't stop raving about it. Interestingly enough he remembered a similar dish of Gari and 'Sars' juice which he had during his childhood days in Togo. He called it Eha Pinon (Pork Pinon) a popular delicacy in Togo, and apparently it's prepared by combining both the pork meat, gari and the 'Sars' juice. He literally salivated at the thought. Now I must really try this. Thankfully I was 'dashed' a bowlful of the pork juice so yayy! As the pork was being prepared, I noticed how indeed Ga people are jovial around food. If you haven't been around Ga's preparing food then you wouldn't understand . There was alot of laughter and friendly Ga insults. You cannot be around Ga's without hearing a few insults, it just doesn't happen 😂. It wouldn't be us. But truly I almost felt at home as I listened to their stories and daily lives in this food industry. Contact Auntie Sophie if you are planning an event and in dire need of fresh clay oven baked pork 0244994088. With all the pigs in this country, shouldn't we be having a thriving pork processing industry by now? The sort of Factories that can produce local bacon, sausages, pork chops and ribs for restaurants, hotels, individuals and of course for the international markets? Perhaps this can even be a project under the one district one factory program. Someone could wonder how a 100 yr-old business is still stuck on using traditional methods and hasn't expanded to be a million-dollar business yet. How can small scale businesses grow in Ghana if there aren't available resources to support their production processes? I look forward to a day when I would walk into a supermarket in New York and see a well packaged Domedo product next to American beef jerky. The pork was sooo tasty eh! It was juicy, simple flavouring of the salt and paprika made my palate rejoice at such simplicity and goodness. Oh my! Even the domedo at Osu night market doesn't come close..at all! Hope you learned something new from this post. Where do you buy your Domedo from? What makes it special to you? Please do share in the comments below. Apr 5 A KNUST Graduate Was A Cleaner For 6 Months, Then This Happened. Feb 21 Easy-to-Make : Baked Grouper Fish With Sweet Red Potatoes.